The Tea Rooms at Woodstock Gardens are now closed and will re-open in Spring 2019. 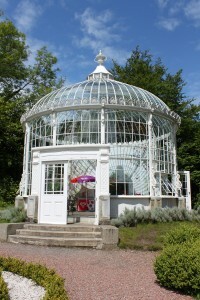 The Woodstock Gardens tearoom is located in the stunning Turner Conservatory overlooking the flower terraces. The tea rooms serve a selection of freshly baked cakes, scones and breads, teas and coffees. On a sunny day you can sit and relax on the terrace outside the tea room. There is a swing nearby and a Dovecote for children to explore while you take 5. The conservatory was designed by Richard Turner, the famous Ironmaster, responsible for the glasshouse range at Kew Gardens in London and the Botanic Gardens in Dublin. The structure is from cast iron with specially curved glass for the roof. It was constructed between 1853 and 1856 and has been described as one of his finest works. Flanking the conservatory on the opposite end of the flower terrace is a cast iron seat with similar detailing. The gates entering into the walled garden are also by Turner. The original conservatory was sadly demolished in the 1950’s and badly damaged with much of the iron work being sold for scrap metal. What you see today is a recreation of the original by the very talented Power family of New Ross. It is frequently hired as a special location for civil ceremonies and parties. The opening hours of the tea room are seasonal.